I must be missing something. Nothing in your post seems to lead me to the conclusion you state. I see 1) a person is reading a translation she hasn’t read before that 2) helps he see things about God she hasn’t seen before. I do not, from this premise, therefore assume 3) The God of the new translation is a different God of other translations. Rather, I assume 3a) something about this new translation communicates some reality about God more clearly than other translations. Can you help me see why my assumption isn’t a fair one, given the data? I think Gladys is noting that she had a change of heart out of he own parochialism. In itself this might have been enabled by any translation, even the one we call the Greek NT. I am always suspicious of adjectives. Is there a new dead translation of the Bible? You can tell I don’t read this one. I don’t like the term international either – sounds like special pleading. So my own parochialism is evident. But (and now I’ve even gone and read the original post), I really see no justification for the assumption that the God of the NLT is some other God…. My concern is with the phrasing: the God of the translation. It gives me the impression of a unique God for each translation, as if readers should prefer one translation or another because of the theology of the translations, rather than because of their fidelity to the original. I would prefer to read something like, “I found out that I had a lot to learn from the God of my tradition, as better conveyed in the New Living Translation Study Bible”; or, “…the God of the Bible, which is better conveyed…”; etc. I think Gladys is noting that she had a change of heart out of he own parochialism. In itself this might have been enabled by any translation, even the one we call the Greek NT. And to be clear: I’m not ascribing any motives here. I’m responding to what I think of when I read the post. So, your problem is not with the NLT, but rather with the way in which Gladys chose to express herself? I might not disagree that one could have hoped for better wording on her part, but as an isolate incident, I’d hardly have given a second thought to it…. Right. I have other issues with the NLT, but I don’t think that it’s trying to create its own God. Yikes! Although I’ll give Gladys the benefit of the doubt and assume that means the one true God as described in the New Living Translation, the phrasing is alarming, and it just might inadvertantly reveal the modern belief that religion is socially constructed by every individual . . . I kinda have to agree with the conclusions of this post, and hope that Gladys didn’t mean it that way. One might speak of “Mark’s Jesus” versus “John’s Jesus” etc. The King wished to determine which of his wisemen was the most reliable, the blind with the gift of prophesy, the blind with the gift of wisdom or the sighted one with the gift of understanding. He sent them to the royal zoo to study the gentle elephant. One blind wise man held the elephant’s trunk and declared an elephant is much like a python. The other blind wise man touched and studies the elephant’s leg and declared that the elephant rivaled the mightest tree. The wise man with ordinary sight said the elepant is too amazing for just words and he asked the King to follow him and see the elephant for himself. The King was pleased. Who’s elephant was I talking about? Was it the same elephant at every turn? Not in the mind of the king! It will always be the elephant to the one with ordinary sight. Don’t be blind. The only error is the reception, not the transmission. >>>The only error is the reception, not the transmission. ISTM that **no one** [present company excepted, of course] gets the text right when they read it, most of the time. And this is “Holy Spirit indwelling” or not. (I find the idea that believers “know all things” because of the “anointing of the Holy Ghost” to be an ironic claim, since Paul teaches **within the scriptures** that “we know in part [ie: from just one angle]”). I would suggest that the scriptures are all but useless, because almost all people ultimately only embrace their upbringing or leaders on almost all points, defending those points like someone who never came within 100 miles of a *real* elephant. So is the problem with the transmission? Or the reception? If, for example, a person who had no prior biases were shipwrecked on an island with just a “Nearly Infallible Version” or “NLT” (sans liner notes), and they read the first chapter, would they come to the same conclusions as the Denominations? ISTM that the castaway would never, in a lifetime, get it right, or get it wrong in the same ways as the denominations. They would probably find a couple of particularly lonely sounding psalms, and re-read those over and over. The scriptures are an unordered mass of esoteric ancient stuff, layered over with thick layers of tradition. The one thing that most “Christians” can agree on, is that the elephant has three heads, even though that is not anywhere in the whole text! Paul said “we see through a reflector, in enigmas.” Was he saying that they prophesied by scrying? At any rate, confusion is bound to ensue when reading the scriptures. I am not aware of a *single verse* of scripture that has not been debated! It is kind of like the Quantum Universe, where all of the possible worlds exist within the scriptures and is “real” for each reader. I’m not saying that I buy that either for the Universe or for the scriptures, but there does seem to be no end to “right interpretations” and “Orthodox readings.” Everyone can’t be right, and a big part of it, IMHO, is the incoherent nature of the transmission. OK, Wounded. What is your point? So much for the brain and nothing for the heart. Are you mistaking the finger pointing out the moon for the moon itself? You have gone chicken/egg on my simple and fairly clear conclusion. Relax and enjoy the clarity. >>>You have gone chicken/egg on my simple and fairly clear conclusion. I appreciate your point, which is valid. I’m digressing. >>>Are you mistaking the finger pointing out the moon for the moon itself? They say that if one person has a drinking problem then that person has a drinking problem, but when 50% of the population has a drinking problem then society has a problem; There is something systemic. Consider the longstanding and passionate arguments about what God’s name is. Trinity. Whether or not Christians are under the law. Church government. The gifts. The Sabbath. What is the precise nature of justification? Water baptism? Etc. Every word is rehashed and rehashed ad infinitum. Cool. 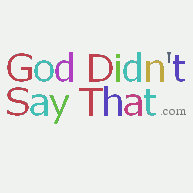 Isn’t it great that God gets it even if we are a bit auto-snafu’d? A great day when we “get it” without complexity.